Black Oliver is a traditional English mid-season black cherry, originating in the west Midlands. 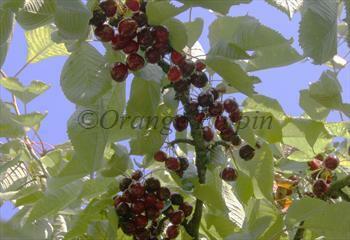 Please fill in the details below and we will let you know when Black Oliver cherry trees are back in stock. Black Oliver is in flowering group 3. Black Oliver is self-sterile and needs to be pollinated by another tree of a different variety nearby. Since it flowers in the middle of the blossom season it can be pollinated by most other cherry trees. Black Oliver has some resistance to canker, a common problem with traditional cherry varieties. The fruit is not prone to cracking.